Entrinsik’s data analytics and BI platform, Informer, radically simplifies the process of accessing, cleansing, blending, and analyzing disparate data by using a single platform to create a cohesive, curated, governed data hub for self-service data analysis across organizations. Informer facilitates self-service reporting using Informer Datasets and Filtering. Informer minimizes self-service reporting errors because you are starting from a common baseline of curated data – a Dataset within Informer. The platform also facilitates collaboration which enables people to comment on reports, share insights, and more. 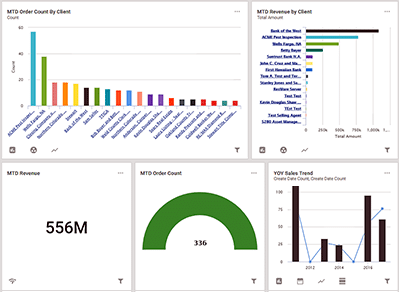 There are several areas of functionality that our customers find highly beneficial and that differentiate Informer from other self-service reporting solutions. Saved Filters. If you can look at a Dataset and write a filter – which you can do easily with Informer – you can save that filter to use when creating a report. The filter you create for the Dataset represents important criteria you’ve established for pulling in the data you want within your Dataset. Maybe you need “current transactions for today” or “transactions of employees that live in a certain state.” Such filters are available to all users that have access to the dataset. You can define very complicated filters for users and they simply add them with a couple of clicks. Informer Discover. Informer’s Discover feature is ideal for self-service reporting. Often, users have a specific question to ask of their data. They log on to the reporting tool, get the answer, and they are done. However much of the time, users don’t have a finite question to ask; they want to see significant trends or groupings in the data but may not know where to start looking. Discover solves that by enabling you to click on specific columns like “state” and “order amount,” and Informer immediately displays charts relevant to those aggregations. Users then have an immediate visualization to interact with to help tell if those aggregations are significant. For example, let’s say you click on a state and get a distribution for all the orders for the last three days, and the numbers are the same per state. Maybe the geographic distribution for those orders is not significant, but maybe in your business plan you’re spending marketing dollars evenly across certain states per capita. You see sales are a lot better in one of those states and click on that state and see the numbers are skewed a lot more there. Well, you’ve just piqued your curiosity and start thinking this is something to investigate. You may even find it worthy of a report, all by simply clicking the button and immediately viewing the trend.People may not necessarily know what questions to ask when conducting data analysis. That’s not unusual with self-service reporting. However, the answers they start seeing with Discover may stimulate additional questions to ask. If you click on sales people in Discover, you may notice their sales are spiking up. From there you can further aggregate, or drill down into the data, even map the orders. Discover makes it easy for you because you can simply check a box and instantly see those aggregations. Informer Collaboration. Another differentiator is Informer’s collaboration functionality. Maybe you want people to view your data, but you don’t want everyone looking at it because the information might not be ready for everyone to review. With Informer’s sharing capability, you can do that. For example, I may be a member within an Informer Team but I may not know anything about a particular Dataset. Maybe I started clicking some of the check boxes in Discover and think, “Wow, Bob’s sales are through the roof so I’m going to create an Informer report and keep it within my Team. I’m also going to send a comment to the Team and say, ‘this needs further exploring, but my database expertise isn’t as good as some of you. Can you look at this with me and see if there’s a way to tweak this to provide an answer for why Bob is doing so good?’”. Single Source of Truth. Given Entrinsik’s many years of designing and supporting BI and reporting software, we found that self-service reporting is both a blessing and a curse. For example, someone might start thinking they’re getting solid answers on a database query they’ve written to answer a certain question. Other people might be running different queries to try to get the answer to the same question. Ironically, quite often the answers differ. Who is right? Maybe the reason the results differ is because in one person’s query, practice orders and refunds are eliminated from the set of current orders; one user knows about those nuances, whereas another might not. Having these two sets of numbers out there, and carrying equal weight, can lead to inconsistencies in the overall analysis of company data. Informer solves this problem by putting the power in your hands to curate data, so you can make sure people see what they need to see. When your Informer Dataset is curated by someone who understands its value of providing a single source of truth, you eliminate a lot of situations like, “My numbers didn’t come out the same as Bob’s numbers; why is that? I just spent countless hours trying to figure out why that is.” Unproductive time and money wasted on people spending time trying to reconcile different answers is eliminated with Informer’s curated Datasets. With Informer Datasets, you’ve now got a single source of truth where you can say, “I’m going to make a Dataset of current orders and this is it, and anyone who wants to report on orders uses this Dataset”. That delivers ROI to your organization. Another reason a curated Dataset is preferred is that no database table that I’ve ever seen has perfect data in it. There are always transactions that are entered wrong and there are always rows that don’t belong — they still exist because in the past, we ignored them. People will also tell you they take data from a reporting tool, dump it into Excel, and within Excel, they eliminate the rows that are wrong. There is a better way! The Informer Dataset can be “that Excel place” where you toss out the junk. One of the common uses of Informer is for people to find bad data in a database and cleaning it up. Here’s a hypothetical example: I’m the one who knows how to create Informer Datasets in our organization and I’m going to create a Dataset based on how people are using Excel spreadsheets. I talk to people and we all agree this is what the current orders and corresponding Dataset needs to be. So, I write my query for current orders and I’ve also been told by Joan in Accounting “You have to eliminate all the orders with ‘Type X’ because those aren’t real orders”. So, I add within my Dataset the following criteria: ‘take out type X’. And she also says take out all the orders that have negative values because those are also junk. So, I add that to my criteria. And maybe there are a combination of fields that can’t be done with a query, however it can be done with an Informer Data Flow step. Data Flow. A Data Flow is simply the stream of data from an initial source, often a database query, into the final Informer Dataset. A flow step is an operation that a designer can add to the Data Flow. A flow step can restructure data, add to the data, calculate on the data, and it can also clean the data. Using flow steps, you can go through each row and say, ‘if this is true for this row, toss it out of the Dataset’. So, you can toss out certain records that just don’t belong. You can run calculations across columns that may span across multiple data sources. You can run multiple pass calculations. You can create scores based on multiple factors in a row. The possibilities are limitless. In conclusion, with Informer, you have oversight and governance of the data, because the curator constructed the Dataset and the rules (Filtering and Data Flows) which were agreed upon. The result is, you have the “golden standard” of that data for everyone conducting self-service reporting. This maybe an ongoing process but people don’t have to worry about what’s good and what’s bad because the curation process takes care of that.